Tersus® offers a great option for specialty crop growers, especially for those with export produce. Pyrethrins–the active ingredient in Tersus–are one of a select few U.S. insecticides exempt from residue tolerance by EPA. Since Pyrethrins have established MRLs in many primary fruit- and vegetable-importing countries, Tersus provides a worry-free choice for insect control including “cleanup” right before harvest. 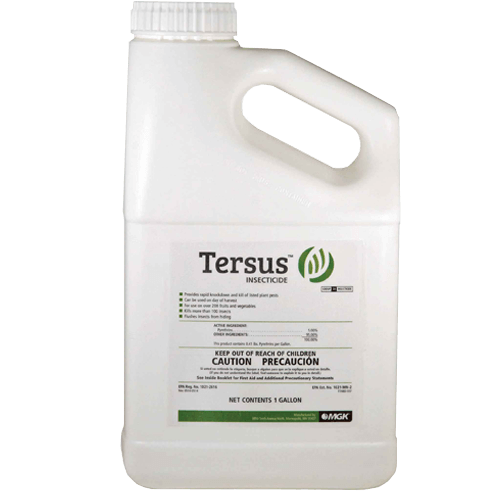 Tersus delivers rapid knockdown and kill on a wide variety of insects on over 200 crops and ornamentals. Is Tersus an Organic product? No, Tersus is not listed by OMRI or National Organic Program for use in Organic production. PyGanic Specialty and Azera PRO are alternative products containing Pyrethrum that are accepted for use in Organic production.